Home / Milking Automation / Why Do We Need Milking Farm Automation? Why Do We Need Milking Farm Automation? Milk is such an essential part of our daily diet that in India every kid will have a glass of milk before going to school or post coming from school in the evening you always get a glass of milk from your mother and what if the milk is not available in abundance and a scarcity of milk that is when we need milking machine manufacturers who can make sure that there are plants who produce milk can produce milk in abundance and that you are never short of milk. They also make sure the milk you get is pure and hygienic. It is 1.2 billion population in India and there are many companies who are into the manufacturing of milking machines only because it is going to help produce more good quality milk to the country at a very good and effective rate so that everybody can afford milk yes even it is very important part of Indian daily diet and milk is needed in every bit and part of daily life. 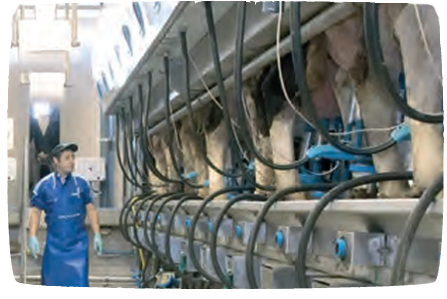 There are Milking machines ... when it comes to industrial milk production. Milking machines manufacturers do an excellent job by manufacturing milking machines as they are an excellent use of technology innovation in the 21st century. Making machine works by a process in which it eliminates elements that are unhealthy or unhygienic during the milking process. So that you can get hygienic and pure milk with no know impurities in it. Delmer India are milking machine manufacturers and the milking machines the Delmer India provides are scientifically designed and developed by an experienced Team of engineers. We all know how technology has helped us to evolve and increase milking process and with the support of our milking machines, you can buy making machines for your milk plants and you can not only increase production of good quality milk but it is also cost efficient where milking industry is concerned.